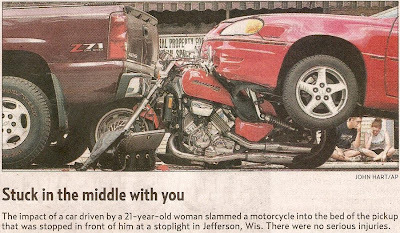 Could you imagine yourself sitting at a red light on a motorcycle with a car bearing down on you? Riding a Bike or a Motorcycle is fun for me, but crashing just like that is a different story. i hate seeing accidents like that especially in the morning news. That is scary.. I am afraid of riding motorcycles.